Victoria City Restaurant is the third on my lunchtime to-do list of places to eat in Causeway Bay, which is where my office is located at. 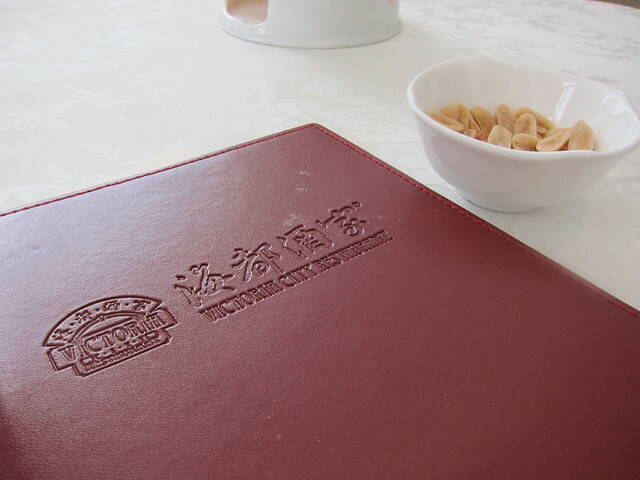 I have heard of this restaurant a couple of times from my colleague, but since it is located within the Crowne Plaza Causeway Bay Hotel (the same hotel where the delightful Pavilion is located at), I thought it would be too posh a place to lunch out on a normal work day. Isn’t it? Well, if a new year is not the best time to break some rules and test some boundaries, I don’t know when is. 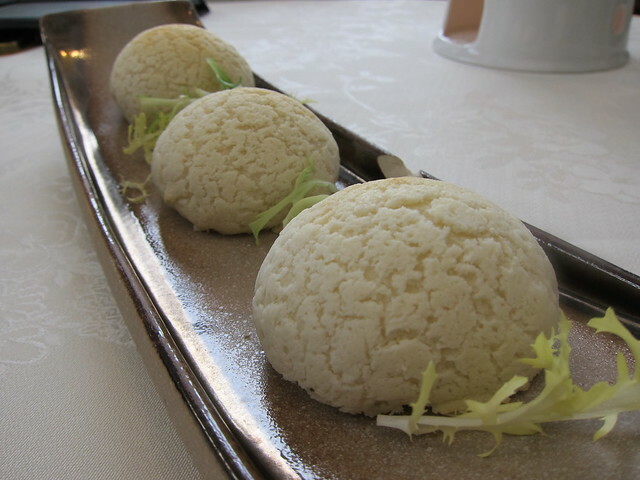 So I threw my frugality mantra out the window and saunter down to Victoria City for a bit of posh Cantonese food. I shouldn’t have worried about the price. The dishes, from dimsum to chef recommendations, were mid-range in price and certainly of great value for a restaurant operating in hotel. Since there were only two of us we were able to try out only a couple of dishes for the day. I wanted to say this is quite an acquired taste – not of the dish, but of chicken feet. But if you have been living in Hong Kong, eating chicken feet for breakfast is like eating raw oysters for lunch (okay, not quite good an analogy). I am not a fan of chicken feet, but often I will try this as a barometer of how good a Chinese restaurant is. This dish was a bit too oily and salty for my taste, but the chicken feet itself is succulent and easy to eat (read: not disintegrating the moment you bite into it, a definite must for those unable to wield a pair of chopsticks skillfully like yours truly). At three large claws we had enough to go for between the two of us. This was beautifully presented, prompting much ooohs and ahhhs from me. It tasted quite as good as it looks. The BBQ pork within was sweet and fragrant though a bit too small a portion compared to the dough, which was crusted beautifully with some “sweet topping”. It was crunchy on the outside, juicy on the inside, and such a combination of texture usually gets my nod of approval. 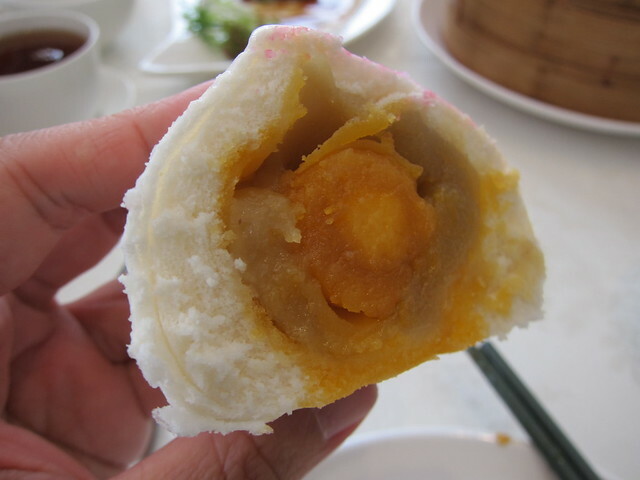 Though I have had better ones (like the ones at Dim Sum Square). A chef recommendation, and my favorite of the day. I don’t know about you, but I found that stuffed eggplants are tricky to execute well. Most similar dishes I have tried before would be a mess of revolting looking soggy eggplants, with the fillings spilling everywhere. Not this one. 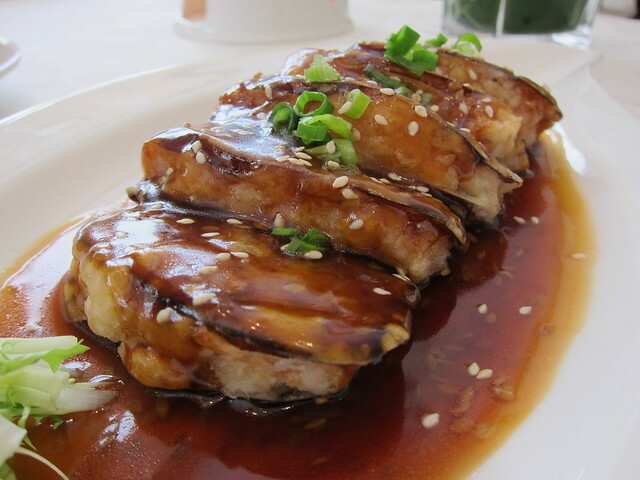 The eggplants were (how do I best describe this…) sturdy and deliciously drenched with some shrimp-based sweet sauce. 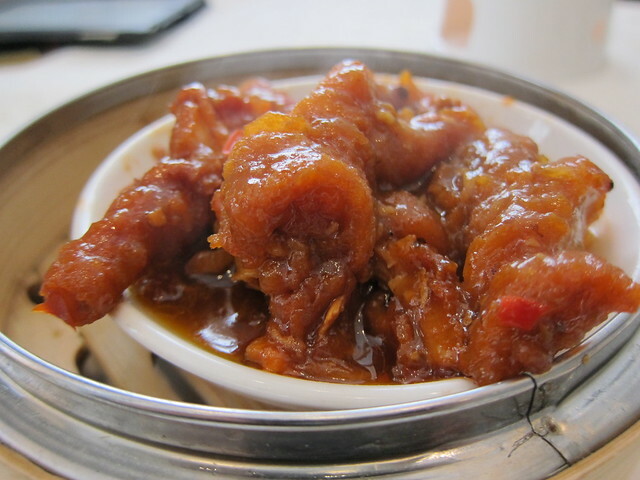 The fillings of pork and shrimp were tangy to the bite with just the right level of saltiness to provide a lovely contrast to the sweet sauce. I would highly recommend this. A word about the restaurant. Victoria City is located on the second floor of the Crowne Plaza, and it has all the trimmings and packaging to look like a hotel ballroom. The layout was quite odd for a restaurant, but the setup was rather elegant, what with the heated teapot and ceiling-to-floor window overlooking some greens. Tables are spaced rather comfortably from each other, and the smallest table can easily seat four person. The place gets packed at lunch time, so make a reservation. Verdict? Won’t be my first choice for Cantonese food, but this is of great value if you want to eat out at a posh place with decent food.